Jeremy Bentham the English philosopher wrote Stretching his hand up to reach the stars, too often man forgets the flowers at his feet. Wise words from a wise man and occasionally - as we shall see - something that can be taken literally. 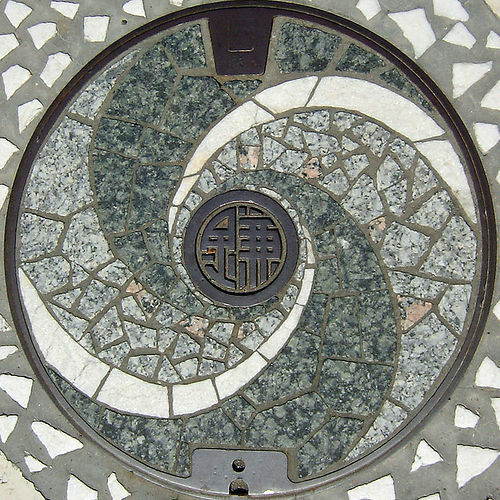 In Japan, due care and attention is paid to every element of urban design and the humble manhole is no exception. 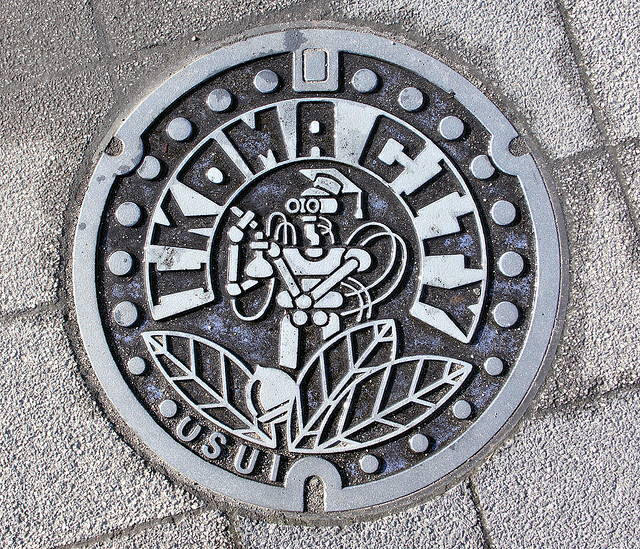 Best, when visiting this country, to look down occasionally. What you see may surprise and perhaps delight you. 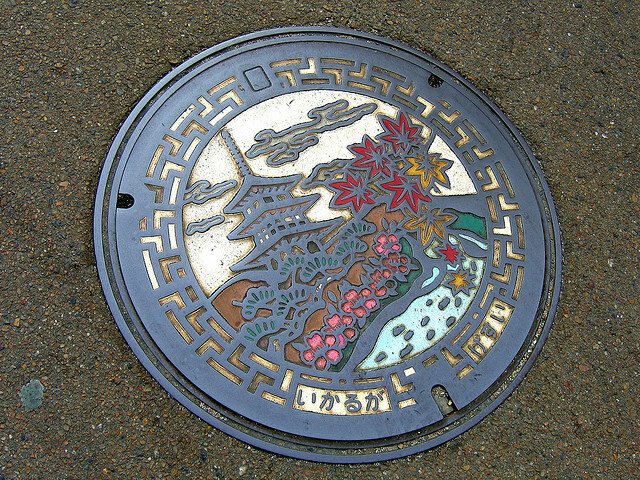 The beautiful mosaic design for a manhole in the city of Kamakura above, shows that even the most functional of objects can have artistic merit. 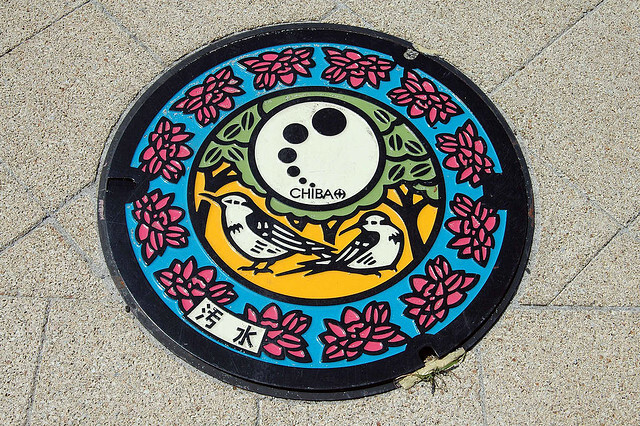 The art of the hole, as it were, is something that has reached the point of a national obsession in Japan with numerous municipal departments competing against each other in the pursuit of perfect manhole cover. This pagoda and blossom motif from Nankou, Osaka is one which captures the tranquility of a temple garden, perhaps an odd choice but one which catches the eye and encourages a sense of tranquility. 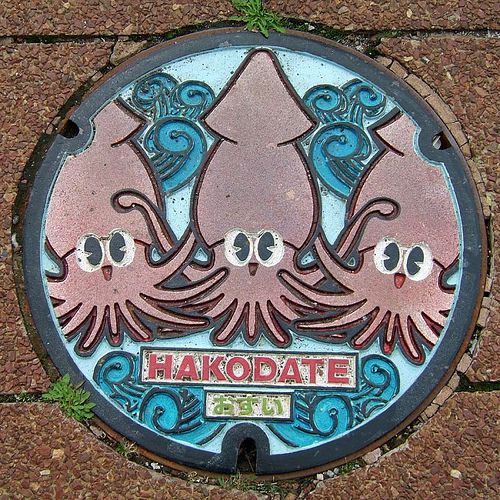 Hokaido is famous for its squid delicacies so the local government decided that the species would be an ideal emblem on its manhole covers. Of course, if you open the cover you will not find any examples of this species. 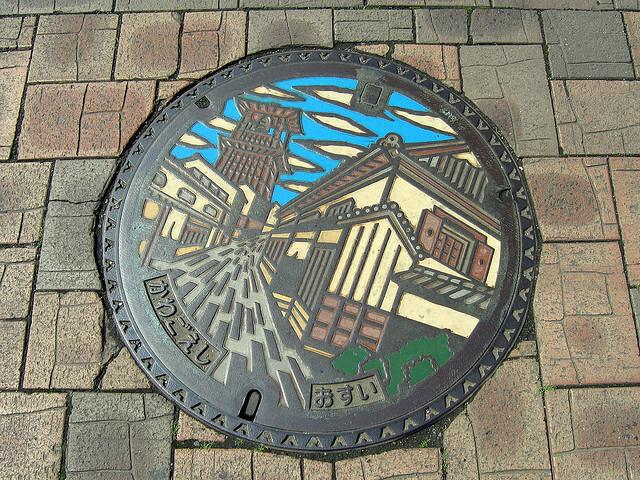 Manholes are used as access points to make connections. They also are entry points for maintenance workers who need to work on public utilities that have been built underground. They can be used for a variety of purposes in terms of access – the workers descending may be going underground to work on maintaining storm drains, gas supplies, and telephone lines or (possibly the short straw) the local sewer system. 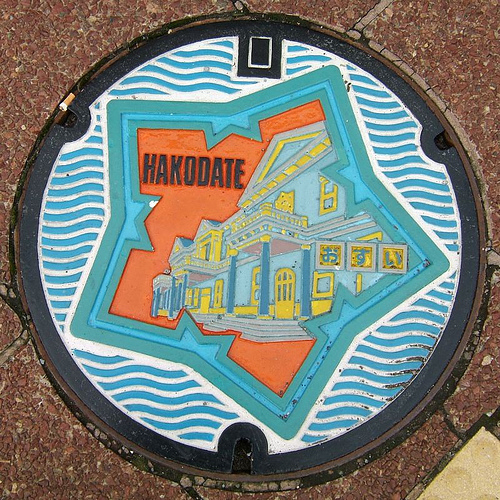 Staying in Hokaido, this cover shows the Public Hall in the center. The outer shape is drawn that way quite deliberately. It is the outline of the local Fort Gorykokaku. 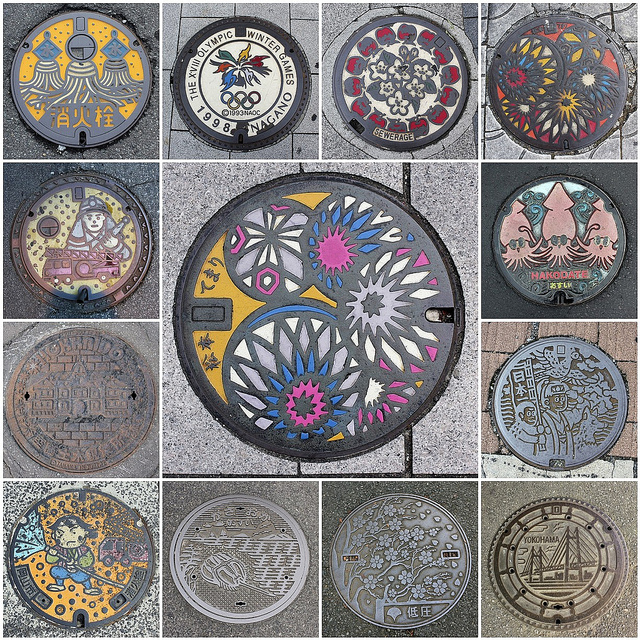 Although these manhole covers are made of metal, those found in Europe are generally constructed of precast concrete. 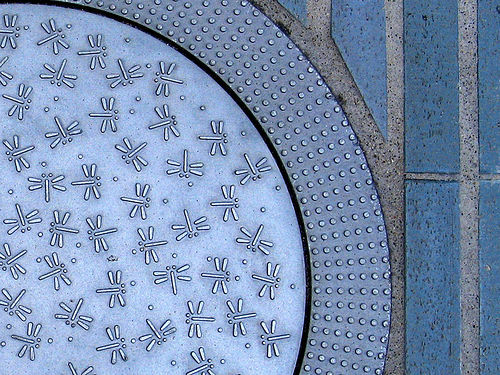 The metal lends itself to art in a much more subtle way. The colors are particularly striking on this and may appear garish to some eyes but not so to the Japanese who like vivid hues. 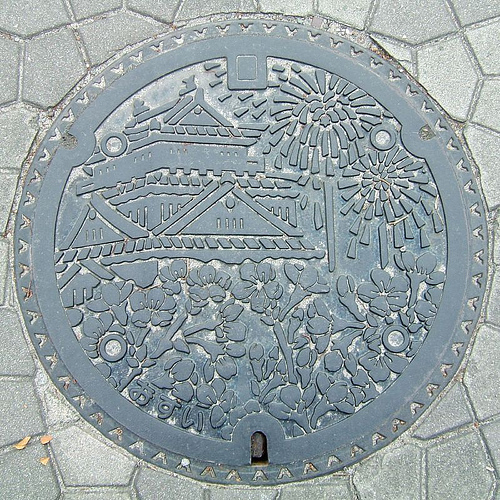 One question often asked is why manhole covers are always round rather than square or rectangular. The answer, it seems, is that a circular shape is that which is best to prevent the accidental slippage of the cover in to the hole. 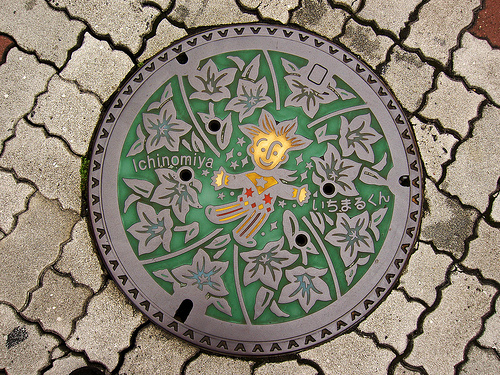 The people of Ichinomiya have happy little people to cheer their day. This would be enough to cheer up most glum people as they walk along, eyes to the ground and shoulders hunched. If opened, this cover would reveal a set of polypropylene or metal steps on the inner side of the wall. These are used to facilitate an easy descent. They are overwhelmingly an urban phenomenon – often telephone and electricity services are carried overhead in rural areas. The little chap on this cover looks like some sort of magician – perhaps he is a character in a children’s TV series (please, if you know, tell us in the comment box at the end). 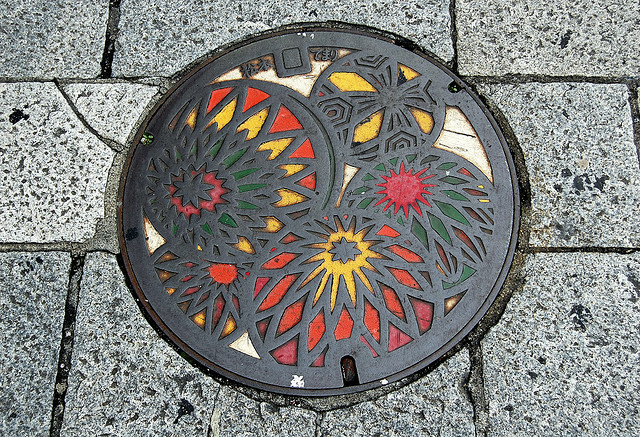 The Marunouchi area of Tokyo goes on step further and instead of individually unique covers it has given them seasonal themes. 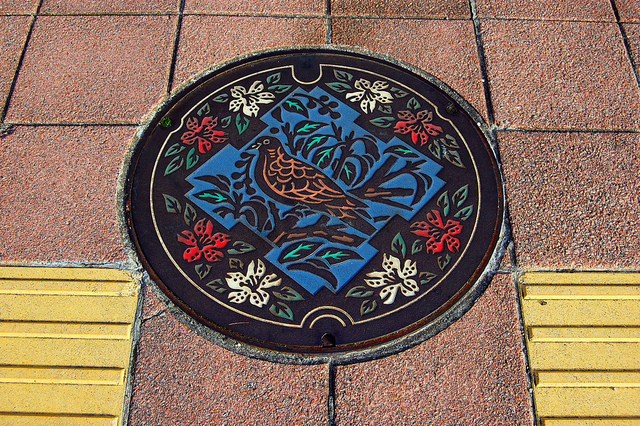 Here, the dragonflies represent the autumn. 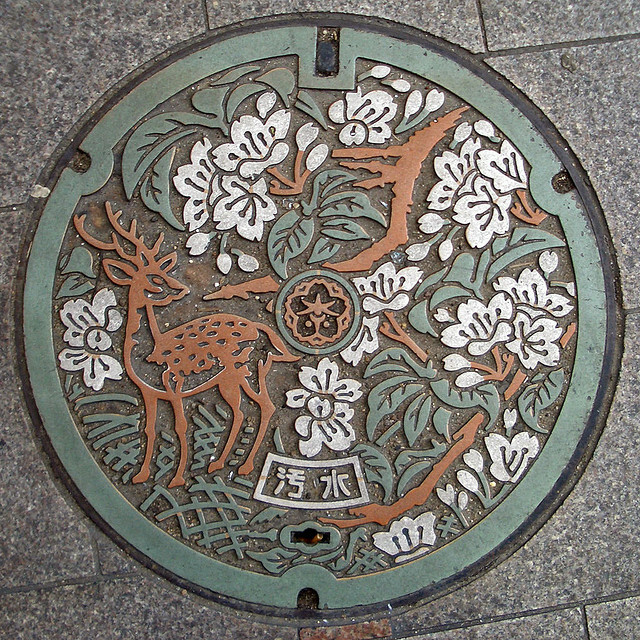 Dotted around the area are other covers representing the other seasons, such as cherry blossoms for the summer. 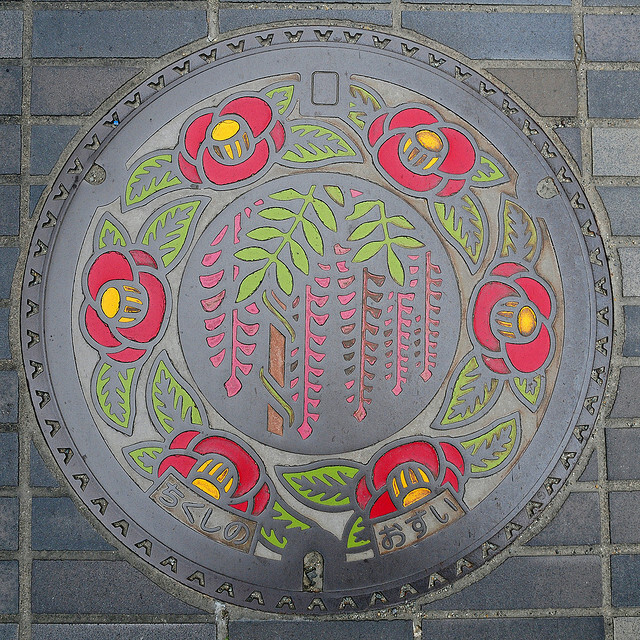 In addition to the seasonal motif, the dragonfly has a special place in the hearts of the Japanese. 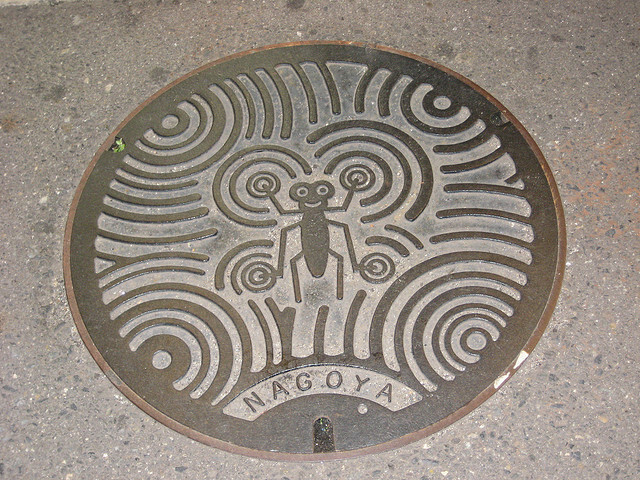 The insect represents courage and strength, victory and happiness. Japanese legends tell of the Emperor bitten by a horsefly. That fly was then killed and devoured by a dragonfly. 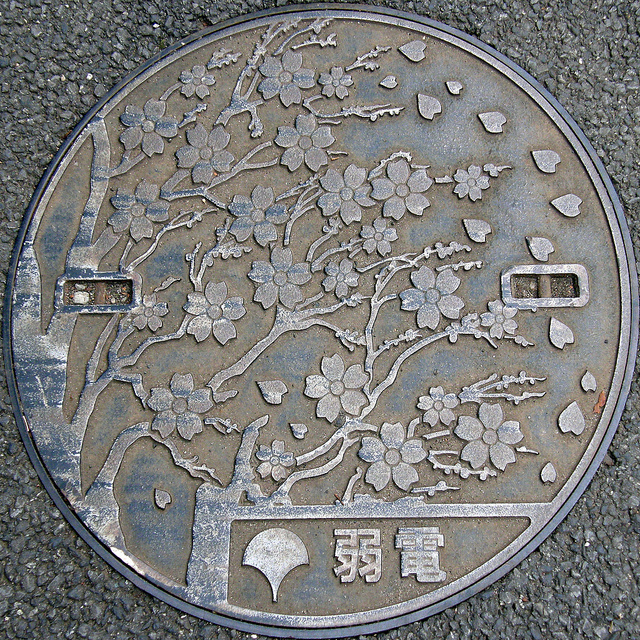 In its honor the Emperor called the country Akitsushima, which translated as the island of the dragonfly. 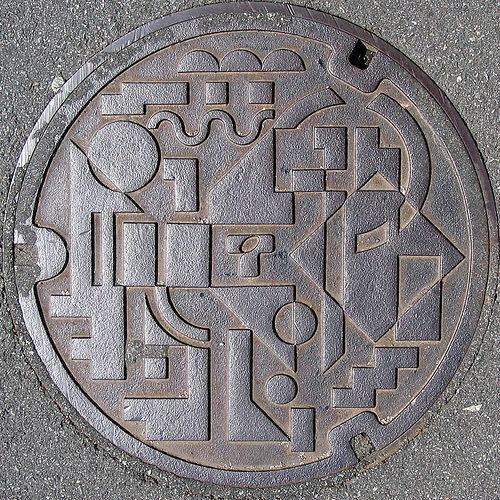 The Japanese are huge fans of modern art and this too is reflected in the design of their manhole covers. Here, the abstract movement is given a passing nod but the true homage is to cubism. 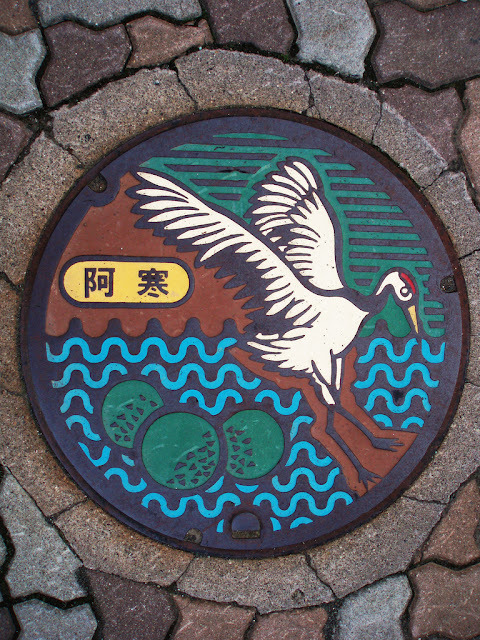 The symbols could be imagined as almost whatever you want, but surely some represent water. The question mark shape in the middle is not, as you might expect, an artistic flourish by this cover’s creator. 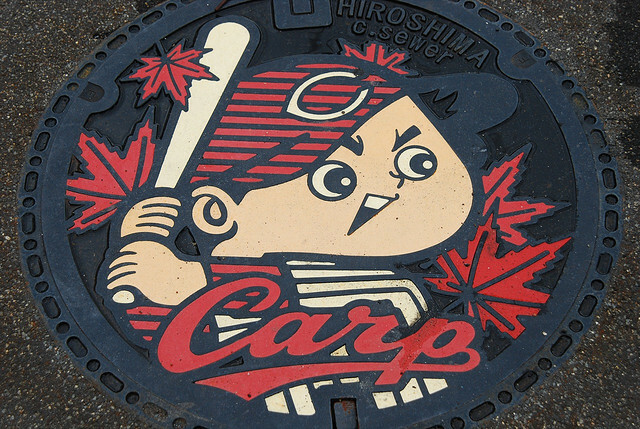 It is in fact the logo of the Toho Gas Company, the utilities of which lie beneath. 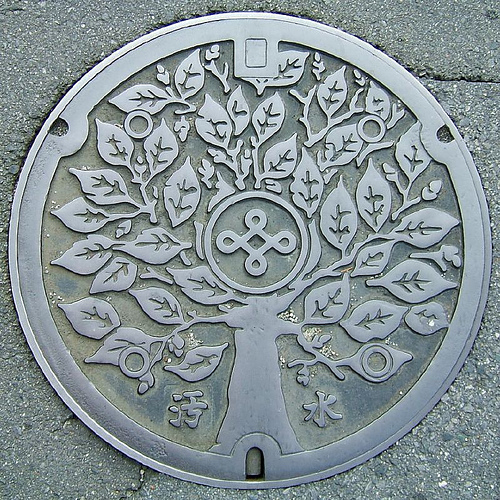 The residents of Sakura-machi in Nishio city have wonderfully ornate trees on their manhole covers, a reference perhaps, to the waste water that flows beneath and will hopefully be reconditioned in order to give life to flora once again. Why not decorative and useful – decus et tutamen? 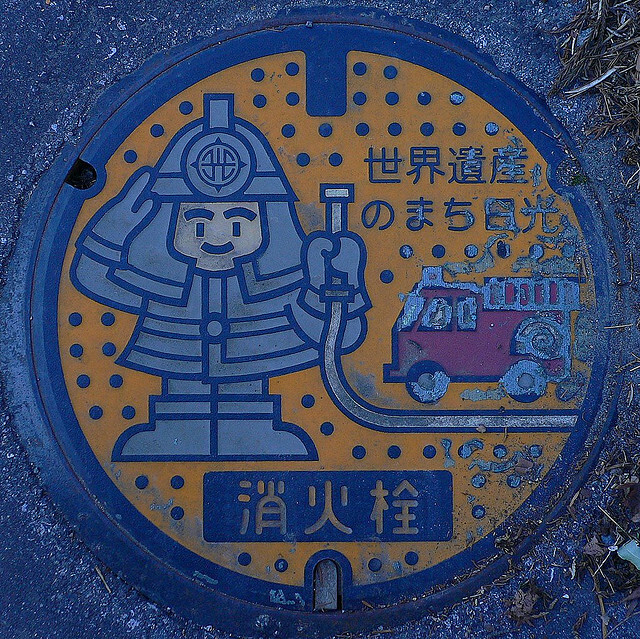 This does exactly what it says on the cover, as it were, and is used by local firefighters in Fujisawa to draw water to douse any local conflagrations. 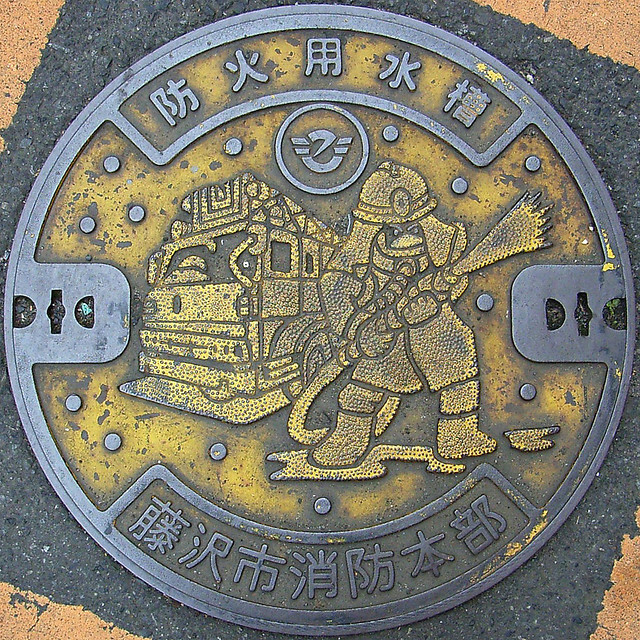 The cartoon style is reminiscent of manga art of old and although the firefighter looks more than a little angry at least the route to his source of extinguishing H20 was clearly marked for him. Perhaps it is a little bit of a cliché, but what visit to Japan would be complete without a passing reference to the Samurai. 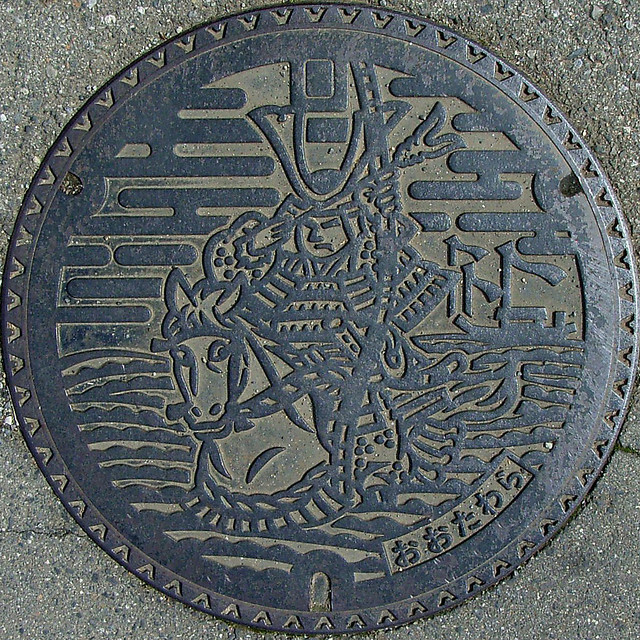 In Tochigi city the manhole covers are resplendent with an aggressive warrior about to shoot an arrow – possibly serving as a warning that those unauthorized to go below will meet an old fashioned fate. What does this represent? 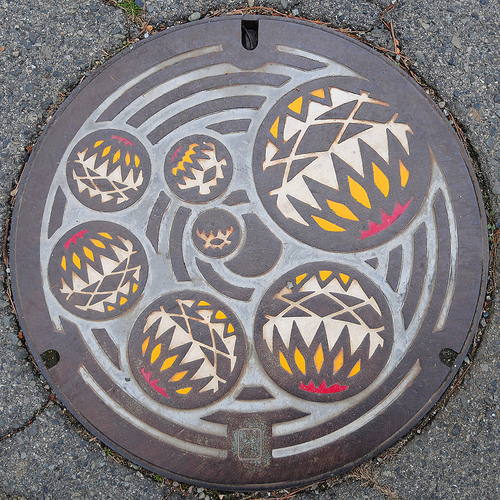 Up to you, but the shapes are beautifully done and make this a manhole to gaze upon. 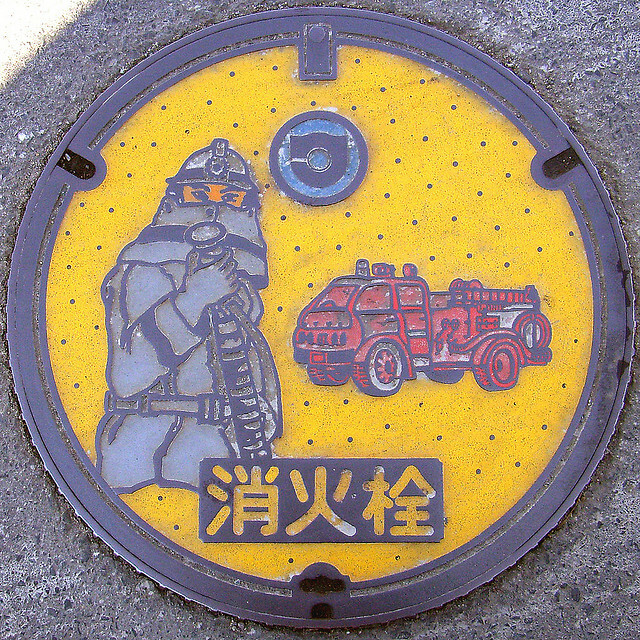 Manholes around the world are known by a variety of names, maintenance hole being popular in the United States. Utility hole is another name they are given but the one guaranteed to raise some more school boy sniggers is access chamber. If you have stumbled on this page in search of a completely different access chamber, apologies for this small interruption of your quest. Take your safe search off, perhaps? 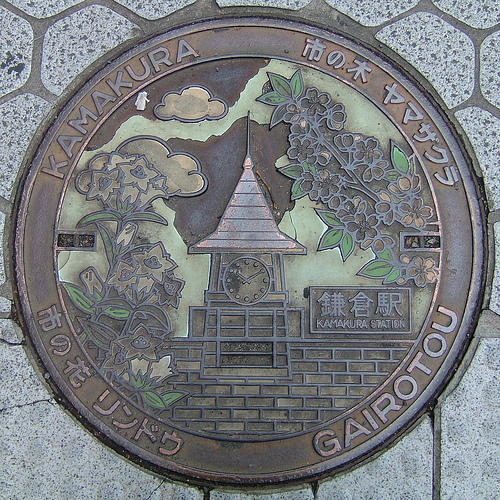 Kamakura takes a traditional artistic route to its manhole covers and the result is quaint but still interesting. The station clock, surrounded by flowers is possibly more picturesque than the real thing, however. 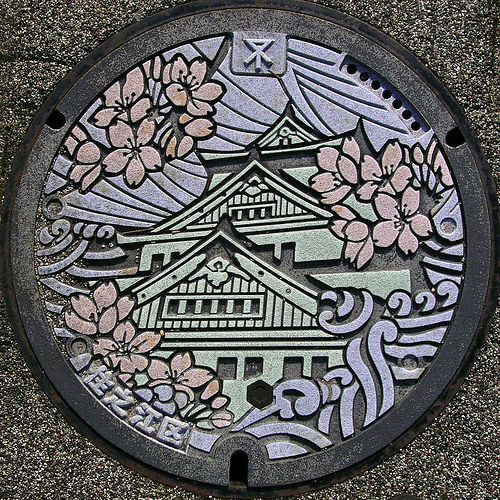 The final picture below, from Okazaki shows traditional architecture, fireworks and flowers, three things of great importance to the Japanese. 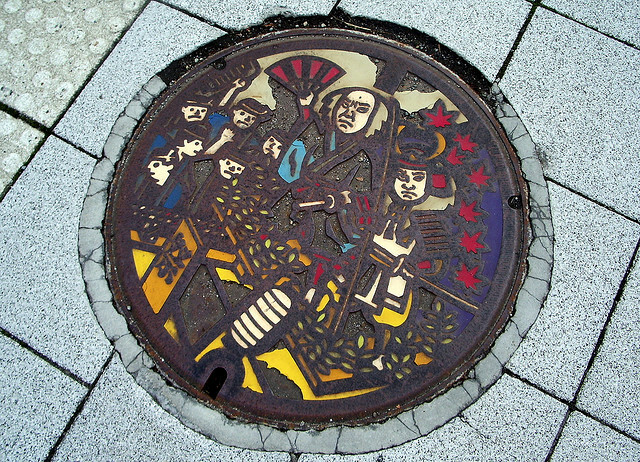 The art of the manhole cover may be considered low, by some, (pun intended) but remains an innovative way to brighten up an urban area and cheer up its citizens in an unobtrusive and again – typically Japanese – humble way.